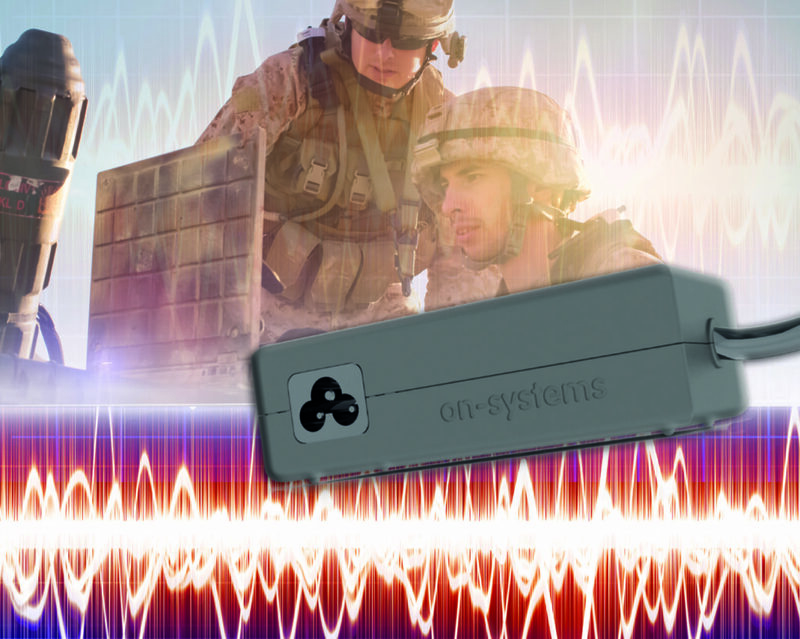 Pebble is a new COTS, rugged, EMI-silent laptop power supply for defence, avionics and mobile applications from On-Systems, a young British company that specializes in innovative power supply design for harsh environments. This new, revolutionary disruptive technology platform for harsh-environment PSUs is a fraction of the size, weight and cost of current designs – in fact, 90% smaller and lighter and 80% lower in cost than standard military-grade PSUs. Traditional laptop power supplies must be electrically ‘silent’ for use in secure, harsh environments and are about the same size as a laptop – they weigh 2-3kg, because they need so much filtering and heatsinking. Pebble, by contrast, retains the familiar look and feel of a commercial power adaptor, yet it is fully certified for defence use. Pebble is the first in a series of harsh-environment PSUs from ON-Systems which combine a new topology, custom-designed FET drivers and fast switching speed to deliver industry-changing benefits. On-Systems’ new topology combines three stages into one, reducing I²R losses and increasing efficiency. On-Systems has worked with a leading power semiconductor company to design new very fast FET drivers, allowing Pebble to switch at up to 40 times typical switching frequencies. This high speed reduces the size of the EMC filtering components required, such that the laptop PSU meets all defence EMC performance standards, including MIL-STD 1275A-E, MIL-STD 704A-F, DEF-STAN 59-411 and MIL-STD 461 E-F EMC, in a package measuring just 115 x 52 x 36mm and weighing only 180g. Pebble is 96% efficient, operates over universal AC input range and wide DC input range, features short circuit, overload and overvoltage protection, and carries a four year warranty. ON-Systems new PSU platform combining a new topology, custom-designed FET drivers, fast switching speed with its huge space and cost saving will disrupt the market and deliver industry-changing benefits. It can be used in many diverse applications – notably in aircraft fuel pump systems, medical theatres and lighting rigs – where the space and weight saving will be of special interest. Rugged, EMI-silent PSUs can now be delivered that occupy less than a quarter of the space, weigh less than a third and cost less than a half of traditional units, yet which carry all international approvals. On-Systems was founded in Aldermaston in 2010 to address the needs of customers working in high-reliability industries for efficient power supplies that save size and weight yet meet industry needs for ruggedness and EMC performance. The company offers a full range of standard AC/DC and DC/DC PSUs, 3-phase and VPX units and battery management solutions as well as a custom PSU design service. The company is ISO9001 (2015) qualified and products are built in the UK to AS9100 quality standards.